Many problems on the Heisenberg group do not have satisfactory answers due to the fact that the centre is not compact. We have observed this in connection with the restriction theorem, the Wiener-Tauberian theorem and the maximal theorem for the spherical means. Some of these problems behave better when studied on the reduced Heisenberg group or Heisenberg group with compact centre. By taking the Fourier series of functions in the last variable, we can reduce problems on this group to problems on the phase space ℂ n equipped with the twisted convolution structure. 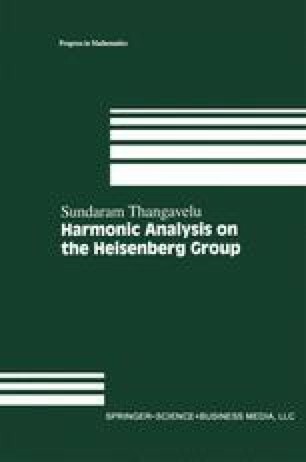 In this chapter our aim is to study some of the problems treated in previous chapters in the setting of the reduced Heisenberg group.